Edith Collier, The Korero, oil on hardboard, c.1927. Collection of The Edith Collier Trust, on long term loan to the Sarjeant Gallery Te Whare O Rehua, Whanganui. This work was conserved with the generous support of Malcolm and Margaret Edgar in 2004. One of the delights of working with an historical art collection is discovering new information about the art works in your care: details about the subject of the painting, where the work was painted and why it was painted. These treasured facts and stories build a context, adding meaning and value to the art work. Recently the Sarjeant Gallery Te Whare o Rehua Whanganui was approached by a local resident regarding a painting of Rongoa Whakaahua Ponui, also known as Mrs Tirotiro Ponui of Kawhia, in the Gallery collection. Esther Tooman is the great grand-daughter of Tirotiro Ponui, painted by Edith Collier (1885-1964) when Collier lived in Kawhia c. 1927. Thanks to the efforts and generosity of Esther Tooman, the artwork file is now filled with wonderful stories and photographs of Mrs. Ponui and her whanau. Until the 1990’s there was confusion over the identity of the sitter of the painting, caused by mis-spelling of Tirotiro Ponui’s name on the reverse of the frame. 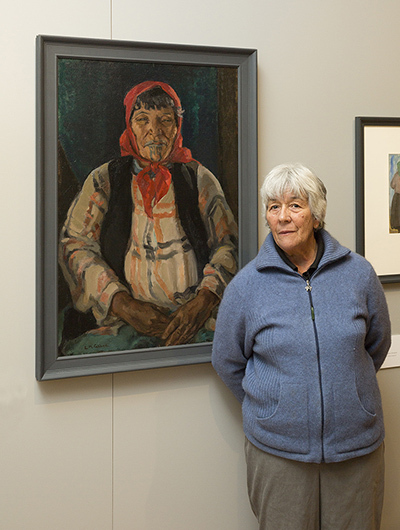 When the painting was included in an exhibition Women by Women at The Portrait Gallery in Wellington in 1993, it was noticed that the name did not look correct. The Portrait Gallery got in contact with Edith Dockery in Kawhia, whose grandmother was Tirotiro Ponui’s half sister. Those who knew Tirotiro remembered that she found the pain of having her moko engraved on her top lip so great that it was never completed. It was believed her pain was caused by the fact that her father was of French descent and had, with all other pakeha, been banished from the King Country during the Land Wars. Her identity as the sitter was confirmed beyond a doubt once Dockery saw a colour photograph of Collier’s painting, sent by the Sarjeant Gallery, because the moko in Collier’s painting is also incomplete. Esther Tooman was able to clarify the identities of another portrait by Edith Collier in the Edith Collier Trust collection, held in the care of the Sarjeant Gallery. Ritihia Tahuri is a recent acquisition for the Trust and it had been assumed she was the same person as another portrait Maori Woman in the Trust collection as the two looked so similar. We now know that Maori Woman is in fact Ritihia Tahuri (also known as Ritihia Cowell). Esther supplied us with a photograph of Ritihia Tahuri beside Tirotiro Ponui, a copy of which is now in the Gallery files. 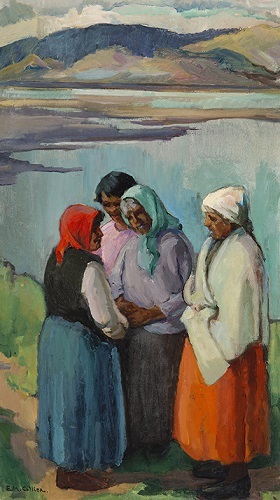 Some of the published art historical comment about Edith Collier states the belief she was influenced by her travels in the Mediterranean and altered the colours of the clothes in her paintings at Kawhia to make them brighter. However Esther informed us that her great grandmother Tirotiro Ponui was known for her colourful petticoats and brightly coloured clothes, a trait that Esther enjoyed when she was young. Collier was accurately recording the bright oranges, reds, greens, blues, and pinks she saw, evident in The Korero an oil on hardboard painting c.1927. We are very thankful to Esther Tooman for taking the time to talk with us.